Archaeologists do not remove artifacts from shipwrecks for souvenirs. However, they may remove a few special artifacts for study or to place in a museum. Because these artifacts have been wet for many years, they must first be conserved (treated to prevent decay). Conserving artifacts is one way to share them with the public. Conservation is expensive and takes a lot of time. That is why archaeologists remove only what they need for research. Underwater archaeologists leave most artifacts in place as "underwater museums." Shipwreck divers are told to "take only pictures and leave only bubbles." 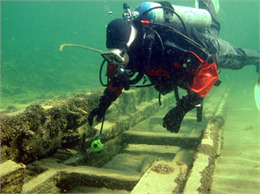 In fact, laws protect underwater shipwreck sites. Of course, archaeologists also gather information. Then they write reports or books, or create websites to share their research with others.